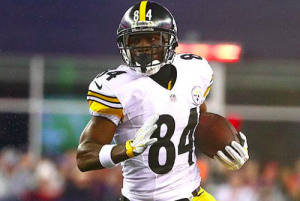 Wide receiver Antonio Brown remains the Pittsburgh Steelers biggest question heading into Sunday’s Divisional Round playoff game against the Jacksonville Jaguars. Brown was officially listed as questionable on Friday’s injury report. Despite optimism from the Steelers for much of the week that he’d play, there is still a chance Brown will have to sit out Sunday’s game. The calf injury that kept Brown from playing in the final two regular season games may not be the biggest issue at this point. After Brown got a chance to rest the injury for a couple weeks, Steelers head coach Mike Tomlin said Brown has “looked really good” in practice this week. However, the team was forced to send Brown home because of an illness. It’s unclear how serious the illness is for Brown. He was a full participant during practice on both Wednesday and Thursday, indicating the calf injury is no longer a concern. But now a case of the flu could keep Brown off the field or hinder his performance in the team’s most important game of the season to date. Playing without Brown would be a massive blow to the Steelers. The Pittsburgh offense functioned just fine the final two weeks of the season without him. But those games were against the Texans and Browns, two teams with lackluster defenses. Sunday, the Steelers will be facing the no. 2 scoring defense in the NFL. The Jaguars also limited Pittsburgh to nine points on three field goals when the teams met earlier this season. Brown will be personally matched up against Jacksonville’s Jalen Ramsey for much of Sunday’s game. It’s a much-anticipated matchup between two of the best players at their position. Despite Jacksonville’s lopsided win over the Steelers earlier this year, Brown got the better of Ramsey in that game, catching 10 passes for 157 yards. But such an effort wasn’t enough to get the Steelers in the end zone or give them a win, leaving both players with much to prove this week. If Brown is absent or limited in any way, the Steelers will have to lean more on Juju Smith-Schuster and Martavis Bryant. Both players have had productive seasons and come on strong late in the year. Of course, both also benefit from teams having to focus so much attention on stopping Brown. Neither did much during Pittsburgh’s first game against the Jaguars, so they could end up being X-factors on Sunday. However, they’re not nearly as dangerous without Brown on the field. Ultimately, the odds are good that Brown plays on Sunday. Even if he’s a little under the weather, it’s hard to envision him not playing. But the fact that he’s listed as questionable is still a concern for the Steelers. If Brown isn’t 100% because of the illness or his calf, the game could swing in Jacksonville’s favor. The Jaguars have an elite defense, and so even an offense as prolific as Pittsburgh’s will need all hands on deck. The Steelers definitely need Brown to be fully healthy if they’re going to advance to the AFC Championship Game.